I'm not very forgiving of mistakes, especially my own. 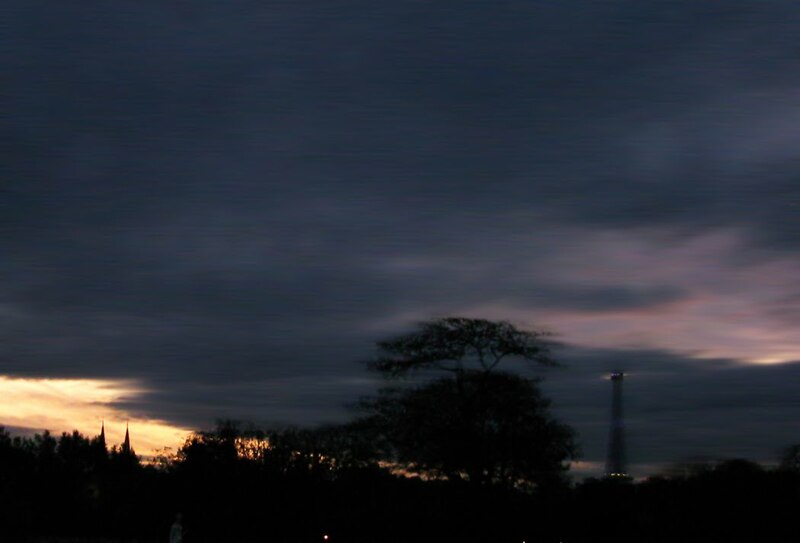 But sometimes the wrong results turn out to be much more interesting, like this blurry accidental photo of the Paris sky at dusk, with the Tour Eiffel a tall vague presence off in the distance on the right. I have some very nice "correct" pictures of the same view, and I'll never look at any of them twice. 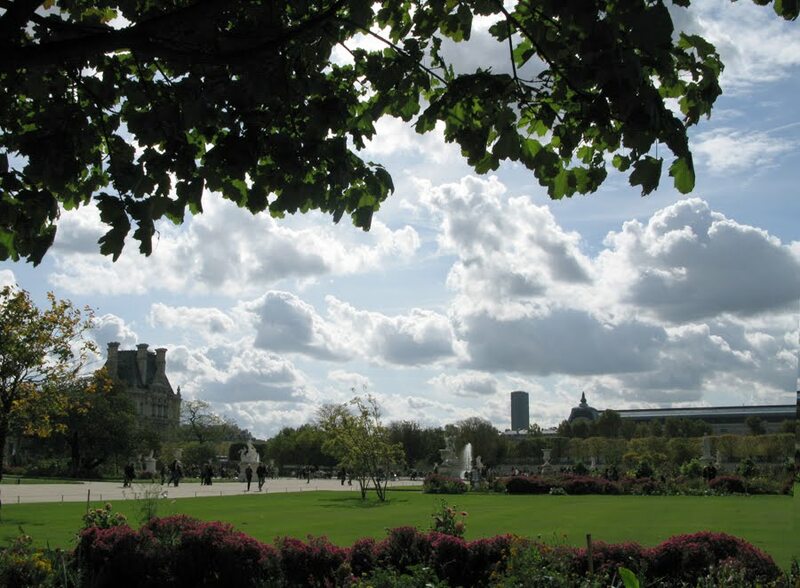 Why oh why do I love Paris? That sky for one thing, and the way it's so strangely quiet in the Tuileries that you can literally hear a leaf fall. It's not silent: there's carousel music and children laughing and intense fashionistas ducking out of the show tents to scream Italian into their cell phones and the drone of traffic on the other side of the wall. But somehow it all fades into a pleasant background white noise and you can hear your fingers slide on paper as you turn the page of your book, and the creak of the bench as you shift your weight, and the soft tap, tap, tap of leaves falling to the ground. I always go to Notre Dame first when I'm visiting Paris. I no longer know why; I just always have. I had purposely picked Paris for this vacation-not quite a vacation just because I know it so well, and I've done all the touristy things before and I can sit in the Tuileries and read a book and not feel that I'm missing out on all the amazing glamorous activities everyone around me seems so caught up in. You can hardly call Paris settling, but after too many years with no vacation followed by the disappointment of the big glamorous Egypt adventure that never happened, and the year running out and vacation days waiting to be used, I picked it simply because it isn't an adventure. Been there, definitely done that. No stress, no bother. I know how to be in Paris. And if something happened at the last minute and I couldn't go, I'd be disappointed but I'd just plan something else some other time. So definitely no pilgrimage to Notre Dame was required this time. I woke up the first morning tired and jet-lagged, and my hotel was up near the Opera, and I decided to go somewhere else instead, probably a cafe, anywhere with coffee. 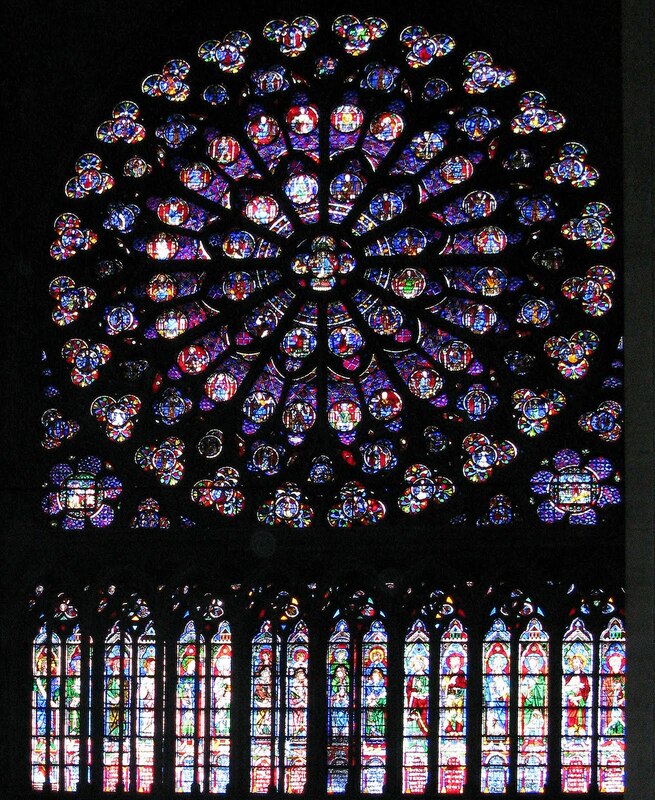 But the weather was beautiful, perfect October, and before I knew it I was on Ile de la Cite, shuffling my way into the cathedral with thousands of tourists to look at something I'd seen dozens of times before. I made my way up the aisle and sat down, grateful for the dubious comfort of the stiff wooden seat, and tried to ignore the flashing cameras and whispered conversations around me. Why had I come here exactly? 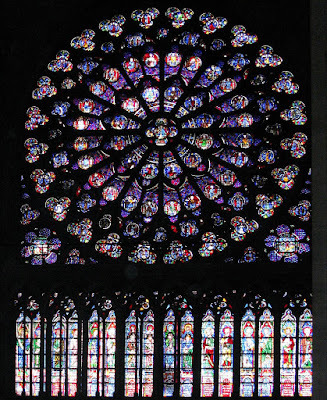 Then I looked up at the rose window. How do you say "gall bladder" in Arabic? I only got to Lesson 2 on my Egyptian Arabic CD, and could rattle off "Thank you" and "I don't understand Arabic" but definitely not anything that would have helped in a medical situation. Not that it matters anymore; I never made it to Egypt, and I am no longer in possession of a gall bladder. As you might suspect, the two are related. I started to have stabbing pains in my back the day before I was due to leave, but I assumed I had pulled something packing. The vomiting the next morning was obviously excitement or nerves or both. Certainly not anything that was going to cause me to miss a trip I'd been planning for seven months, for my first vacation in almost thirteen years. Which is what I kept telling them at the airport several hours later, when I was throwing up every ten minutes, running a fever and doubled over in pain, but still insisting that I was fine, really, and I was going to be getting on that plane. The airline had other ideas -- understandably, they really don't like it when people need medical attention on long flights over bodies of water. And they retrieved my luggage from the plane, and called an ambulance, and I started on a different kind of adventure than the one I had intended. I used to write postcards whenever I took a trip. Lots of postcards. Embarrassing numbers of postcards. No day was safe from news of me, wherever I happened to be at the time, detailed in microscopic printing over every molecule of blank space that the postcard printer provided. Even if I wanted to take that habit up again on this trip, I couldn't. I'm still recovering from a fractured hand, and my handwriting is large and loopy and largely illegible, like a first-grader trying to forge her mother's signature. So I am going to blog, whenever I have both Internet access and energy. And when I don't, look for a postcard with a childish scrawl wishing you were here.